Cabernet Sauvignon has always been a speciality of Helm. A trip to Bordeaux inspired winemaker Ken Helm and grower Al Lustenburger to perfect the most profound constructs of Cabernet Sauvignon. The Canberra district is perfectly suited to growing this noble grape, as the mesoclimes, so similar to those of Bordeaux, are influenced by trade winds during summer which carry a whiff of sea salt and stimulate the vines. Helm's inaugural vintage immediately attracted praise from the industry press and claimed significant wine show awards. Helm is a family owned operation, one of the first commercial wineries within the Canberra district. Ken Helm and daughter Stephanie are a father and daughter team, the fourth and fifth generation descendants of migrants from the Rhineland who established vineyards near Albury and Rutherglen in the 1860s. 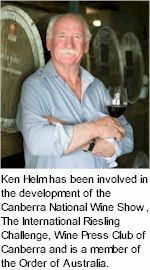 Papa Helm has been involved in the development of the National Wine Show, Cool Climate Wine Show, Wine Press Club of Canberra and numerous promotional events for the Canberra region. Helm craft their Cabernet Sauvignon in the statuesque style of the great Medoc growths. The finished wine is released after two years maturation in a selection of seasoned and new oak casks. Deep garnet red colour. Bramble bouquet with hints of loganberry, violets and licorice over lightly smoked oak. A finely balanced and elegant wine with the richness of berry fruits and butterscotch flavours deriving from two years maturation in oak casks. Fine tannins provide another dimension to the wine. A long, dark fruited finish with lingering notes of savouryness, cassis and dusty Medoc oak.